If we know anything about the rain in Spain, it’s that it stays mainly in the plain. Except that it doesn’t. 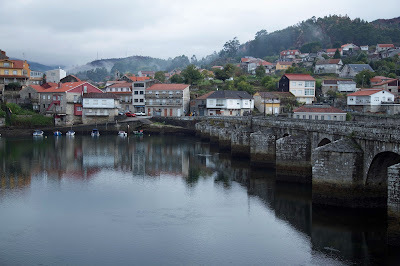 We know that before we cross over from Portugal into Galicia. 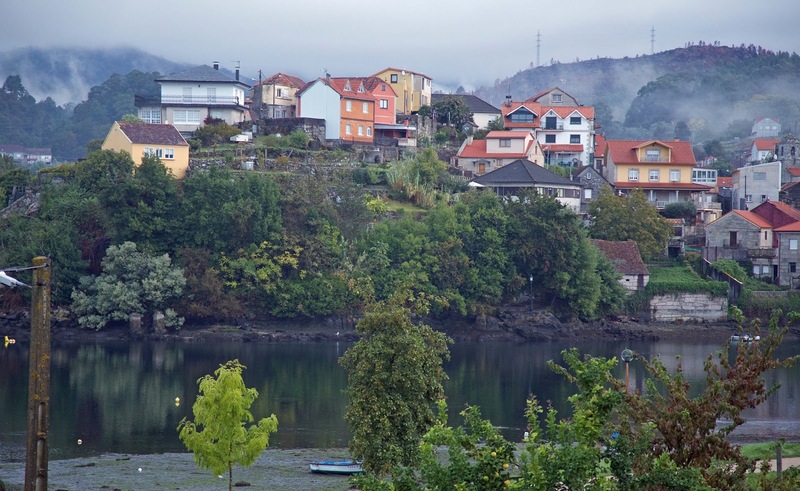 The ancient kingdom of Galicia is NOT in a plain. 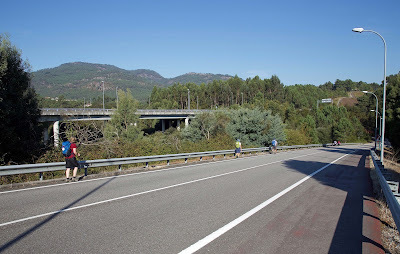 In fact it’s hilly and green, and one of the better-watered parts of Spain. We will soon experience all that first-hand. 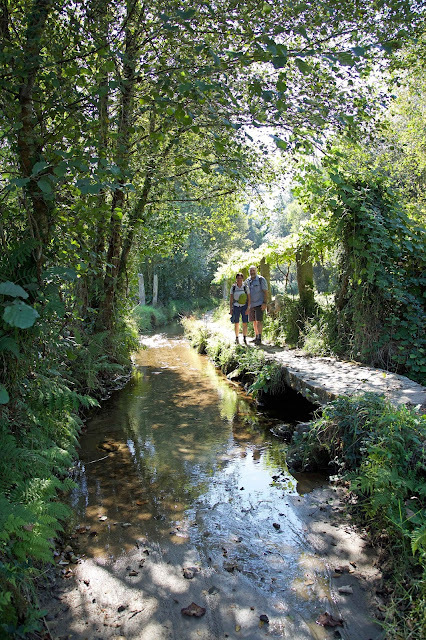 But first we have to endure one of the (thankfully rare) sections of main road walking on the camino. Cobbles might be hard on your feet, but busy roads are hard on your mind as well, adding the fear of whizzing traffic. We put our heads down, and walk as quickly as we can to our next off-road section. 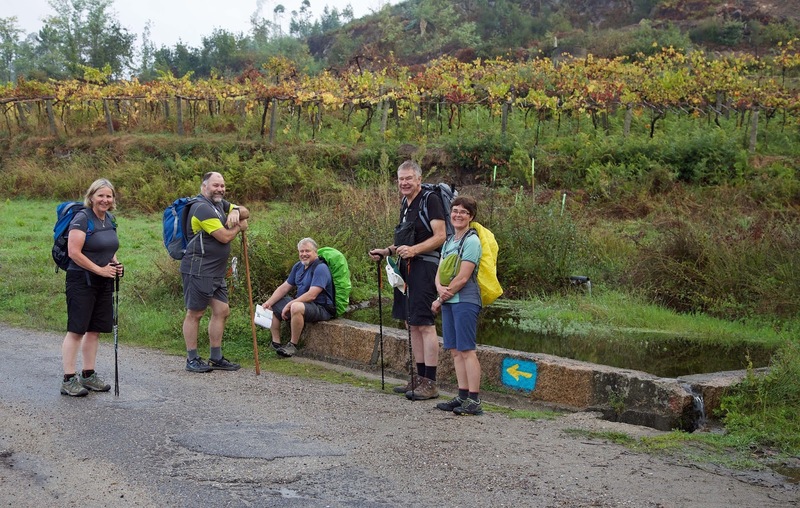 We’re now noticing more pilgrims, partly because they’re easier to see on a road, but partly because quite a few pilgrims only do the shorter sections leading into Santiago. Strung out along the road we look like a modern take on Chaucer’s The Canterbury Tales, with groups of pilgrims knotted together conversing, laughing, stopping to do repairs, sharing food, and greeting other pilgrims. Unless you’re a recluse or a curmudgeon, a camino has a strong social element. Our short-comings in Spanish limit some of our interactions, but we’re still finding it more social the further we progress. Whether we’re walking and talking on the way, sitting and chatting over drinks; or sharing accommodation or meals together, we’re forming bonds. And inevitably we’re comparing notes, whether on blisters, food, accommodation or the reasons behind our pilgrimage. Bill and Karl are two American pilgrims we meet often. They’re are a source of great fun and amusement. Like a classic odd couple, the one short, loud and loquacious; the other tall, quiet and laconic, they bicker and bounce off each other constantly. Walking or socialising with them is like being part of a sit-com. Or sometimes like being the audience, as when quiet Karl gently unloads on the ebullient Bill after one too many nags. 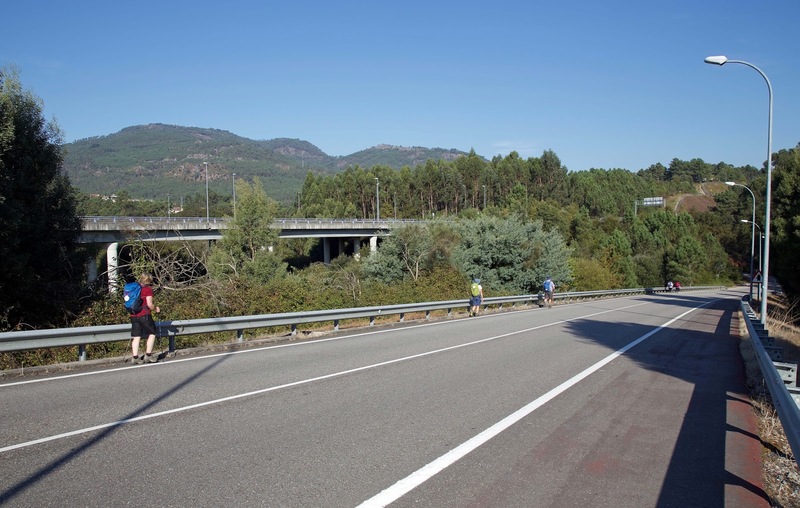 Karl has been limping almost the whole time, having become badly blistered early in his camino. But he’s quietly determined to get to the end regardless of his pain or his pace. “It is what it is” he says, encapsulating something that we all end up applying to the journey. Whether it’s the weather, the distance left to walk or the pain of blisters, “it is what it is“ becomes our way of surrendering to the road; of dealing with both joys and disappointments. 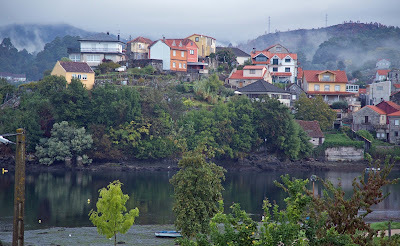 One of the latter comes as we approach the coast for the first time since Porto. We’ve heard that the town of Arcade, on the Ria de Vigo, has some good swimming spots. Most of the way through Portugal it’s been warm and dry, and the thought of swimming has had a big appeal. 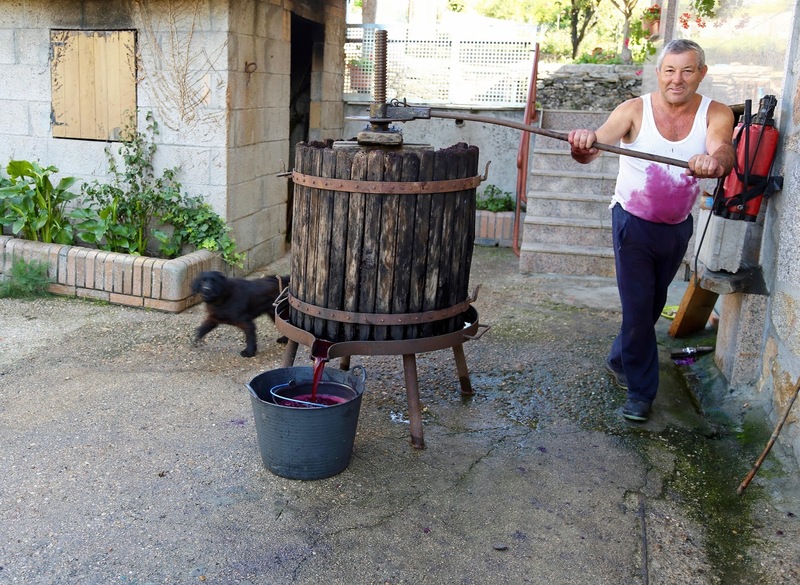 We lunch in the pleasantly busy old town of Redondela. It’s cool and cloudy, and we still have a long uphill road section before Arcade, where we’ll stay the night. By the time we’re into the worst of the hilly climb, the rain comes. A heavy drizzle wets the road, wets every car or truck that speeds by, making sure that we are soaked through too. There won’t be any swimming today. We plod on through the rain, hoping our accommodation comes sooner rather than later. Tim and Merran are ahead by maybe a hundred metres. We’re following doggedly, as Tim remains our navigator. Before too long he turns and waves, and we see a small hotel that fits the description. Feeling and looking like drowned rats, we start to climb the steps past another group of pilgrims who are sitting at an outside table. Without warning they break into “Happy Birthday”, and it’s aimed at Lynne! Tim and Merran have been telling tales. Today might not be Lynne’s actual 60th birthday, but they’ve heard that the big birthday is part of the reason for our camino. 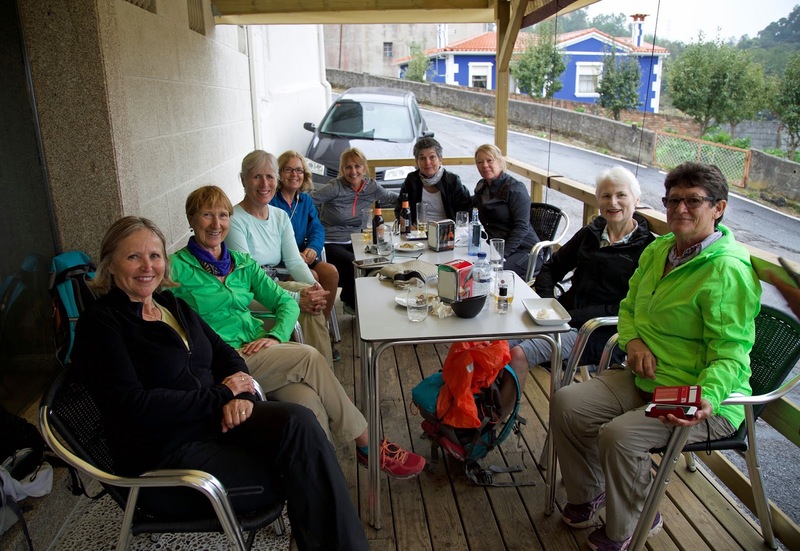 It turns out Kerrie, a New Zealander living in Italy, has had the same idea – for the same number birthday – and has invited “a few girlfriends” on a camino. They’re soon buying us drinks, and we’re chattering away like old friends. The pain of the rough and rainy road, and the disappointment of our non-swim recede into the mist. “It is what it is”; accepting what we’re given. How sweet that sometimes is!